Since 2002, the Seattle Police Foundation has been responding to requests from Seattle police officers to support programs and projects they believe will help them do their jobs better-more safely, efficiently and effectively. We also provide funding to promote opportunities for the Seattle community to interact with their police force in non-enforcement situations and to learn about the police department. June 2003 - SPF purchases its first of several K-9 dogs for the K-9 unit. June 2003 - SPF purchases Police Horse Blaze for the Mounted Patrol Unit. July 2003 - SPF purchases new ceremonial uniforms for the SPD Honor Guard. This replaced the ceremonial uniforms that were outdated and over 30 years old with apparel that projected law enforcement professionalism. January 2005 - SPF purchases initial Blackberry’s for SPD officers without access to in-car computers. The Blackberry’s are attributed to over a thousand arrests and a complete success in its initial test phase. The program is expanded in July 2005. July 2005 - SPF purchased language translating equipment to assist SPD in their community outreach efforts. The equipment allows SPD’s community councils to provide workshops and their outreach efforts in multiple languages. October 2006 - SPF, in partnership with the American Heart Association and a generous private donor, purchased Automated External Defibrillators (AED’s) for every patrol car, three more Harbor boats and all police facilities including the Police Range. This undoubtedly has been an asset for SPD officers. June 2007 - SPF purchases two Electrostatic Dust Lifter devices, also known as “Pathfinder Kits,” for SPD’s Crime Scene Unit. This equipment assists the CSI Unit personnel in the collection of dust prints at major crime scenes. August 2007 - SPF purchases two person First Responder Preparedness Kits for every SPD officer. July 2008 - SPF purchases MyClyns decontamination spray for all sworn personal in the field. MyClyns spray is an FDA approved, non-alcoholic personal decontamination spray that is used to remove threats posed by any bodily fluid that officers may come in contact with. January 2009 – SPF launches an intensive fundraising campaign to “Save our Horses” and committed to providin fundin to maintain the Mounted Patrol through 2014. SPD’s budget constraints in 2009 put the Mounted Patrol in jeopardy, until the Seattle Police Foundation stepped up to help preserve this important crime fighting tool. Without this critical support, the Mounted Patrol Unit would have been eliminated, and the Seattle community would have forever lost a very valuable crime fighting and community strengthening resource. SPF has purchased all horses for the Department since 2003. June 2009 – SPF purchases specialized equipment and funds computer forensics training for SPD’s Child Exploitation Unit. This equipment and training provides additional capability to the Unit to decrease and minimize the delay of computer forensics related to the prosecution of offenses related to the sexual assault and exploitation of children. January 2011 - SPF provides seed funds and fiscal management to assist in the development of the first ever Seattle Police Pipes and Drums. Seattle Police Pipes & Drums honors the memory of those in law enforcement who have given their lives upholding the law. Today the band has more than 25 active members. June 2012 - SPF purchases Care Under Fire Trauma Kits, which are lifesaving measures for patrol officers. Being shot is a very real possibility for every patrol officer, and even simple calls can turn deadly with little warning. The trauma kits are lightweight and wearable, so they are quickly accessible. Each kit provides officers the ability to treat severe hemorrhaging in an emergency situation, and potentially save their own life or the life of a fellow officer. December 2012 – SPF purchases a Forensic Digital Camera for SPD. The camera is allows SPD to conduct forensic examinations not previously possible within the department, by allowing investigative personnel with the ability to visualize physical evidence that would otherwise go undetected. January 2013 – SPF continues a 10 year tradition of providing funds to support the Seattle Police Explorer Post. Explorers gain both classroom and real world understanding of law enforcement and criminal justice. Seattle Police Explorers have many opportunities to apply the training they receive by volunteering more than 4,200 hours of their time to events and training. Success in the Explorer program is not measured by whether an explorer goes onto pursue a career in law enforcement, but is measured by whether an explorer is able to take the skills and values they have learned in the post and apply them to their lives outside the post and whatever career path they choose. June 2014 – SPF provides funding for 9 senior officers to attend Seattle University’s Leadership Institute. August 2014 – SPF provides seed money and programmatic support for the the Beds for Kids Project. Beds for Kids was started by Officers Jeremy Wade and Ryan Gallagher who were inspired to start that project after what they witnessed on a routine call in Seattle’s Central District. When Officers Wade and Gallagher arrived at the scene, they witnessed two young girls who were living in a home with their grandparents, both sleeping on the floor without a proper bed to call their own. The next day, and with their own money, both officers purchased and set up two IKEA beds for the two young girls. With help from SPF, Beds for Kids is now an annual program, giving out more than 100 beds annually to children and families in-need throughout our community. March 2015 - SPF provides financial resources for safer bicycle helmets and specialized crowd management training for SPD’s Bike Squads, supporting both officer and public safety. The new helmets and training were put to the test during the events of May Day 2015. Despite the challenges police officers faced that day, SPD’s Bike Squads were able to use cutting edge helmets that provided them with added safety and flexibility in the field. SPD Bike Squads additionally implemented newly acquired crowd management skills that made them more effective in protecting themselves, the public, and businesses in downtown Seattle. June 2015 – SPF purchases 1,000 Combat Application Tourniquets that are deployed to officers on the front line. These life saving devices are designed to be held on an officer’s vest or gear for rapid, life-saving deployment. Direct benefits of this equipment are increased safety for officers and citizens, now that these rapid, life saving devices have been deployed on the street. March 2016 – SPF purchases the two newest additions to the K-9 Unit, dogs Mia and Delta. July 2016 - SPF provides funds for a four-person SPD Honor Guard to travel to Dallas and represent Seattle at the memorial services for the fallen officers of the Dallas Police Department. 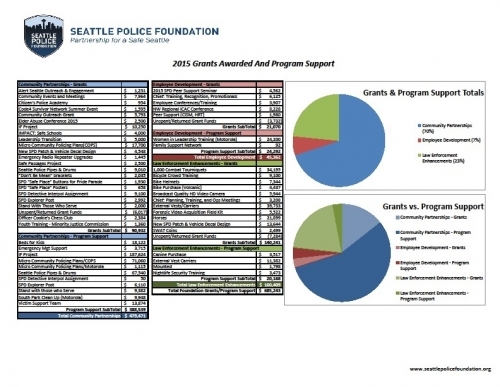 The Seattle Police Foundation supports a number of projects, some on an on-going basis. Based on original grant applications and subsequent evaluations from the annual grants program, the SPF has identified a number of successful programs, some where annual, on-going support is warranted for program efficacy. Click on the image to view the 2015 List of Grants Awarded and Program Support.